This was one of those projects that came out of thin air along the lines of "Wouldn't it be nice to make a figure that pushes a wagon?" Not a wagon with powered wheels and dangly legs, but a man really pushing a wagon. Not something you normally see on a standard gauge line, but very common on narrow gauge railways. A photo of a Welsh slate works formed the initial inspiration for the model, but modelling constraints (making the clothes) meant that he moved several thousand miles around the world! 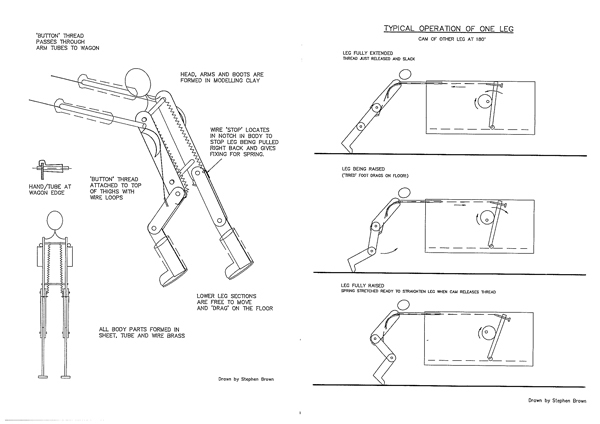 The Walking Man was developed around the same time as the BHER and always appeared in front of it at exhibitions. The model as exhibited (above) was the replacement to the prototype, the gearbox of which was not able to withstand the rigours of prolonged use. For its first showing at the 16mm NG Association AGM & show, a hastily prepared set of tissue clothes were made. A planned Welsh suit and cap were replaced by baggy clothes and a wide brimmed hat. The magazine article that followed, was originally published in Roy Links NG&IR and it was a book given to me by Roy on Taiwanese coal mines that firmly placed the model in the far east. The article was also republished in the USA in Garden Railways. A simple solution (as usual!). A motor in the wagon drives a cam shaft and levers moved by the cams pull threads that run down to each thigh. The legs are normally held straight by springs representing the hamstrings and once the cam-levers release, the springs push the legs straight. Because the mechanism replicates muscles, the movement generated was very realistic. 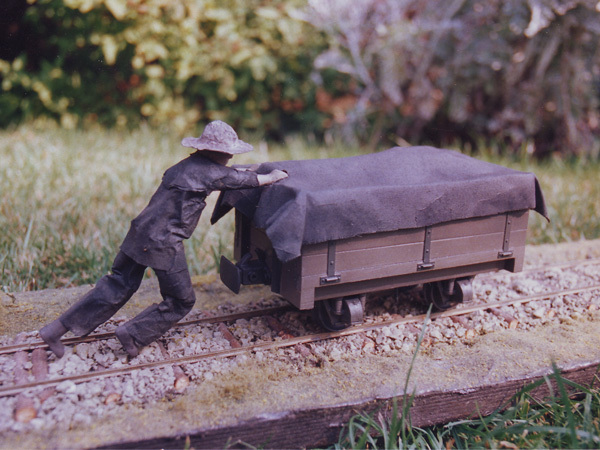 As the man & wagon were self-contained (the motor being powered by a small battery in the wagon) it was possible to lift the man off the track and have him walk on a table or hand, dispelling all other suggestions about how he walked. The track provided a surface for him to grip and, inadvertantly, enabled his workload to be changed at will. Indeed, increasing the incline beyond the capability of one spring caused him to 'hang' mid-push until both springs came into play and a two-legged push occurred inevitably drawing a groan from the crowd. The Walking Man has inspired many 'clones'. This one was spotted on YouTube. The voices are French, but the contributors other models have an American flavour - could it be Canadian?